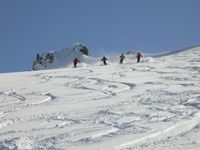 Chatter Creek Cat Skiing is one of the few operators in North America to offer extensive high-altitude glacier skiing. Most of the glacier skiing on Chatter Creek's Vertebrae Glacier occurs between the elevations of about 9600 ft and 7500 ft. Under some conditions 2500 ft vertical drop is possible. 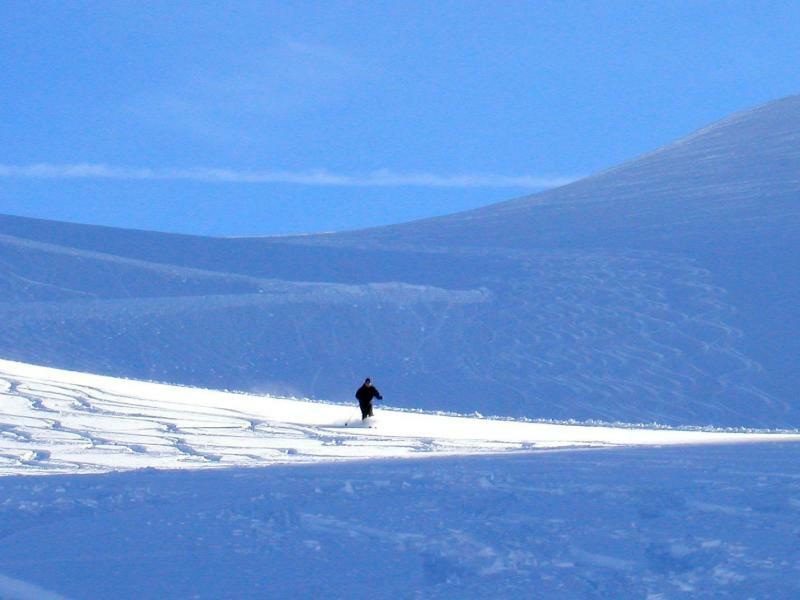 The Vertebrae glacier is sufficiently large to permit multiple groups many runs on the glacier, with each skier having "fresh tracks" in unskied snow, every run. 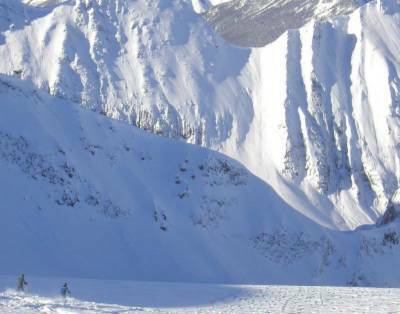 Chatter Creek lies in a productive snowbelt in the Rocky Mountains and the Vertebrae glacier, at its high elevation, is regularly replensihed with light powder snow. 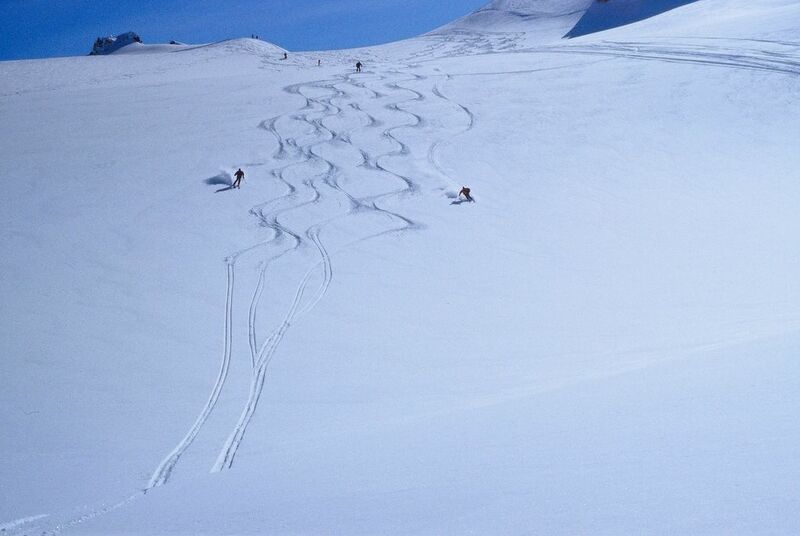 Having a northeastern exposure, the powder snow on the glacier maintains its quality for long periods of time. It is also relatively sheltered from prevailing winds. This leads to good late-season skiing. 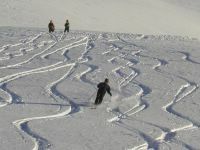 The glacier skiing at Chatter Creek is relatively "mellow", although some of the "drops" into the glacier can be quite interesting for expert skiers. However, a trip to the glacier is always welcome for the views alone. They are spectacular. Typically, only one group of 14 people will ski the glacier in any one day, and then only for a few runs befor heading off to other areas. Scroll down to see some of the vistas that welcome cat skiers to Vertebrae glacier. 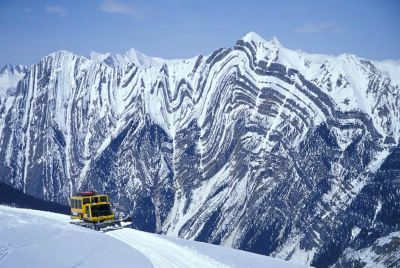 The Chatter News has brought together a collection of snowcat skiing photos taken on and from the Vertebrae glacier at Chatter Creek. 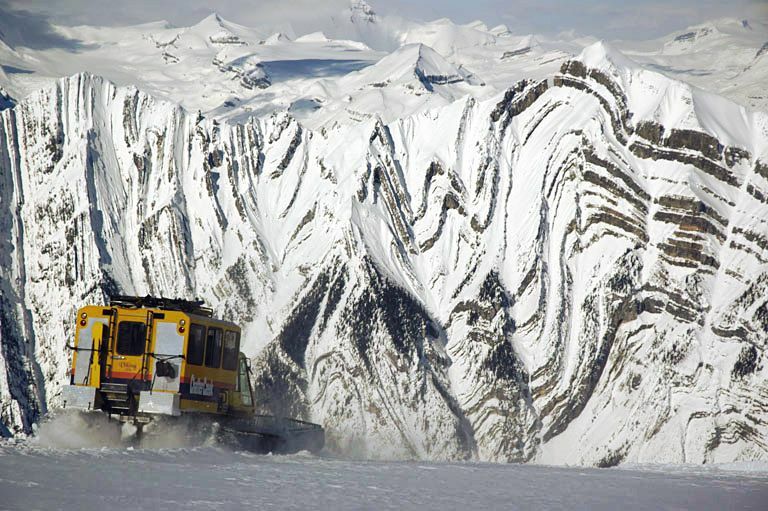 Scroll down to see some of the vistas and terrain on Canada's highest and largest glacier regularly used for snowcat skiing and cat boarding. 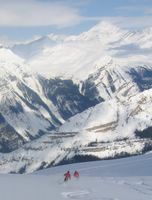 The glacier skiing is mellow and the views are spectacular. However, there are some interesting optional "lines" into the glacier that are nore challenging, including "Throttler's Notch that passes over a small cornice. 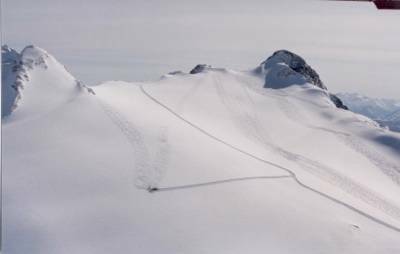 The glacier is over 4000 ft above Vertebrae lodge and the run back home after a few hours of glacier skiing offers many great lines. Click on any Chatter News photo to see an enlargement. Use the "Back" button on your browser to return. 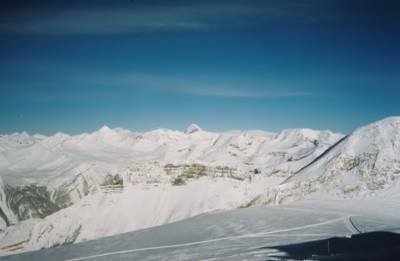 The Clamshell is a second, much smaller icefield that is regularly skied on at Chatter Creek. The Chatter glacier in the Chatter Creek watershed is a third glacier in the Chatter Creek tenure. 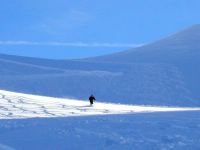 The Chatter glacier is quite flat and is not skied often, although there is wonderful alpine skiing above the Chatter glacier, on upper Lodge Ridge. 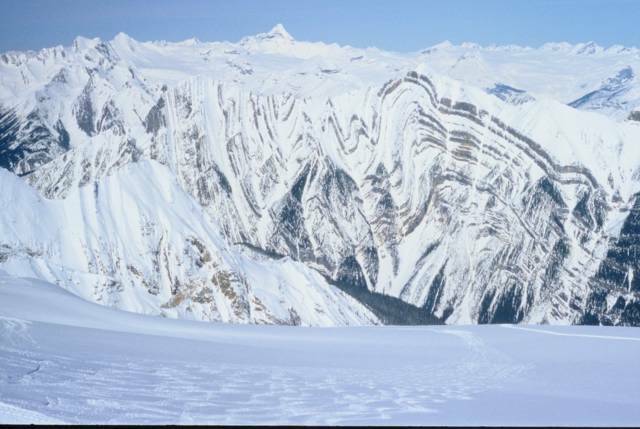 In the spring, the Chatter glacier is used for snowmobiling. 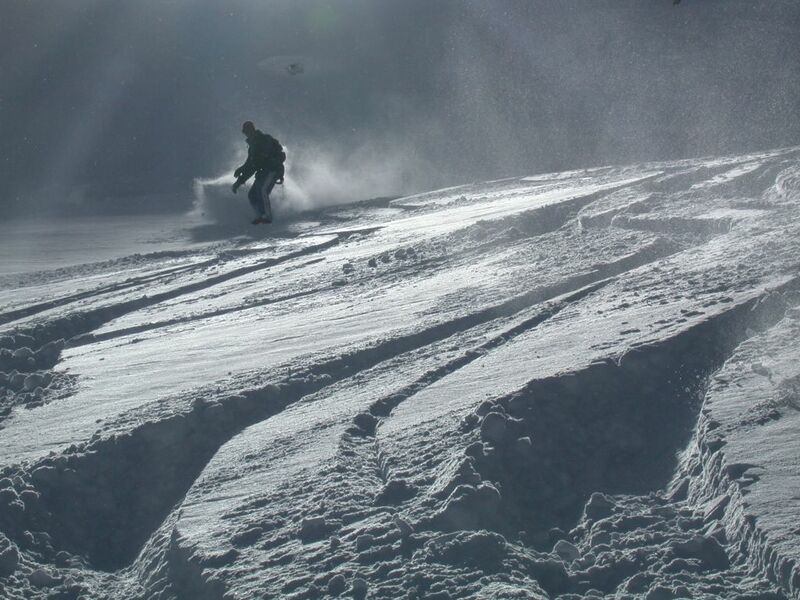 Click here to view our earlier description of glacier skiing at Chatter Creek. For more information and photos about snowcat skiing at Chatter Creek, check out the Chatter News. A spectacular panorama by Christopher Stratas . 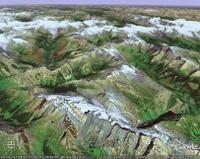 It was stitched together from about 8 photos taken from the top of the Vertebrae glacier at Chatter Creek. Thank's Christopher. This looks as if it would make a great poster. 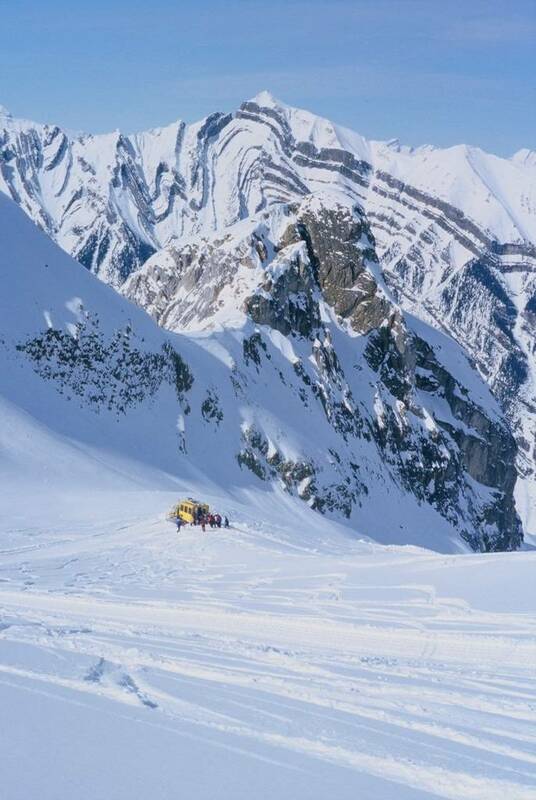 This view greets Chatter Creek guests on a typical snowcat skiing day on the Vertebrae Glacier. Many of the peaks shown form a part of North America's Continental Divide. The glacier falls off below the photographer, in the direction of the photo. 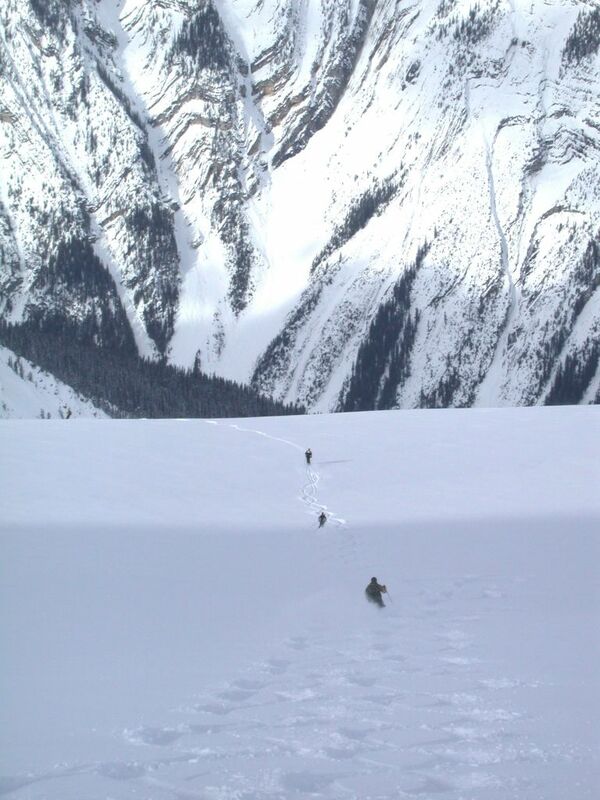 Cat roads and ski tracks on the Vertebrae glacier at Chatter Creek. Access to the glacier is from the far side of the ridge, over the top of the col. The elevation at the top is about 9600 ft above sea level. 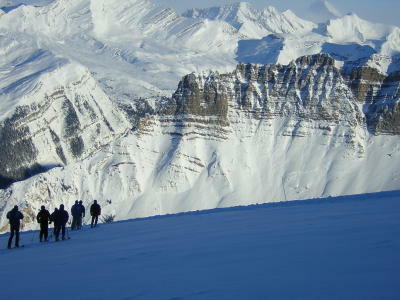 For views and terrain on the way up, see the road to Vertebrae glacier. 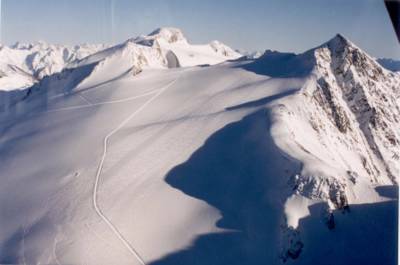 The areas suitable for glacier skiing extend far to the left, and to the right, well outside the picture. The northeastern exposure protects the glacier from the sun and that, together with the high elevation helps keep the snow light and dry late into the season as the weather starts to warm up. Picking up the troops. Photo credit to Wendy Robinson. 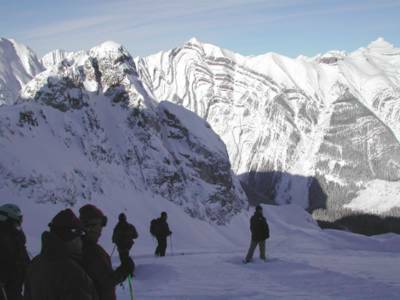 Typically, a group might take four or five glacier skiing runs before moving off to other areas at Chatter Creek. 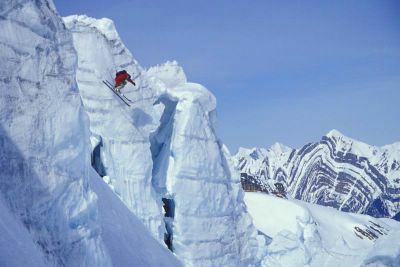 The glacier skiing is very pleasant but, except for some of the entry points onto the glacier, not hugely challenging. Besides the mellow glacier skiing, most Chatter Creek guests like to visit the glacier for the extraordinary views and the experience of being in the very high alpine. The vista to the southeast showing Mt Columbia. The Snow Dome is just visible at the right of the photo. Look at Crichton's photo below for a better shot of the southeastern view, and notes on the Snow Dome. For a closer view of Mt. 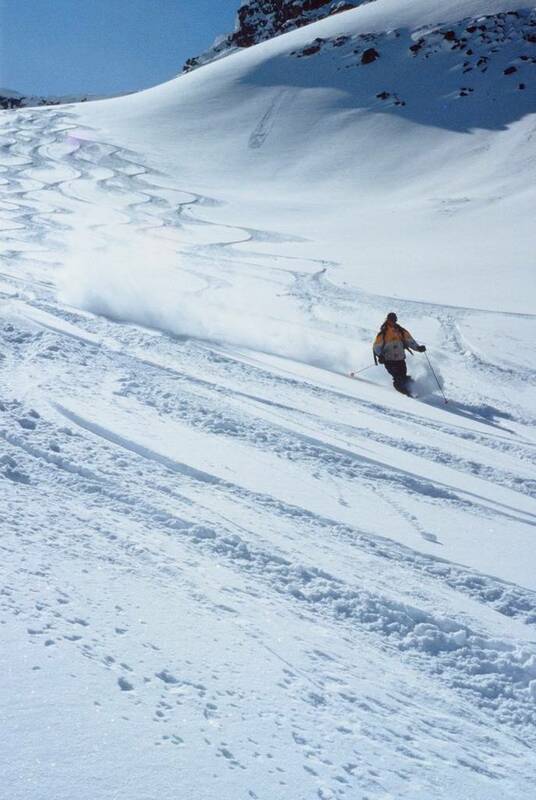 Columbia, look at our gallery of Ski Photography by John Dougall. 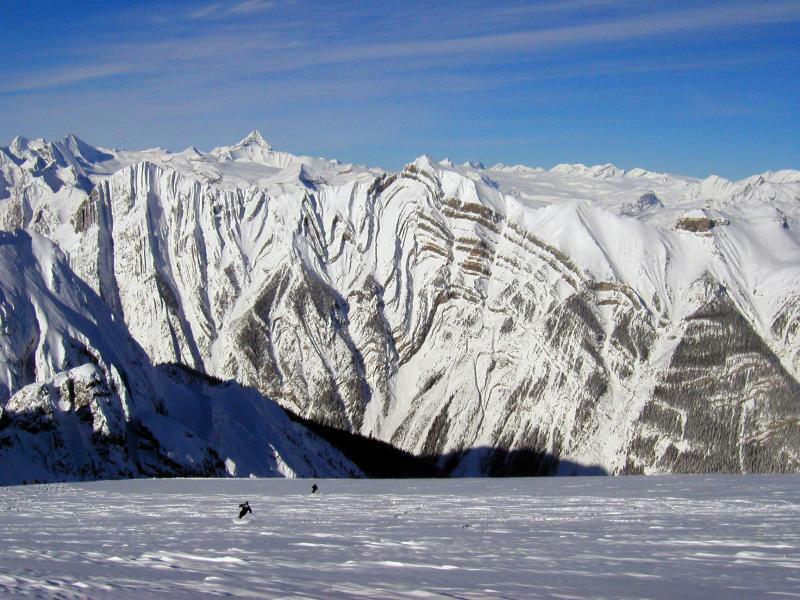 The Vertebrae glacier at Chatter Creek offers mellow glacier skiing amid spectacular mountain scenery. 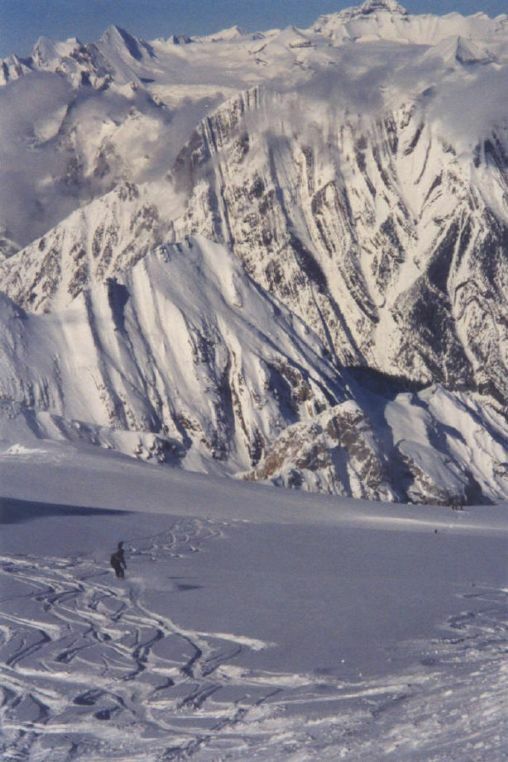 A group of cat skiers slide off across the top of the Vertebrae Glacier on their way to steeper terrain. Mt. Columbia rises on the horizon in the upper right of the photo. The elevation at this point is about 9600 ft. The height of Mt Columbia is 12,293 ft. 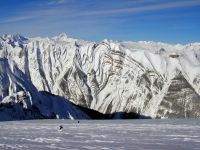 The two panoramas above give a broader picture of the view from the Vertebrae glacier, which offers some of the best machine-accessible glacier skiing in North America. Photo credit to Svante Jonsson. Scroll down to see more of glacier skiing at Chatter Creek. 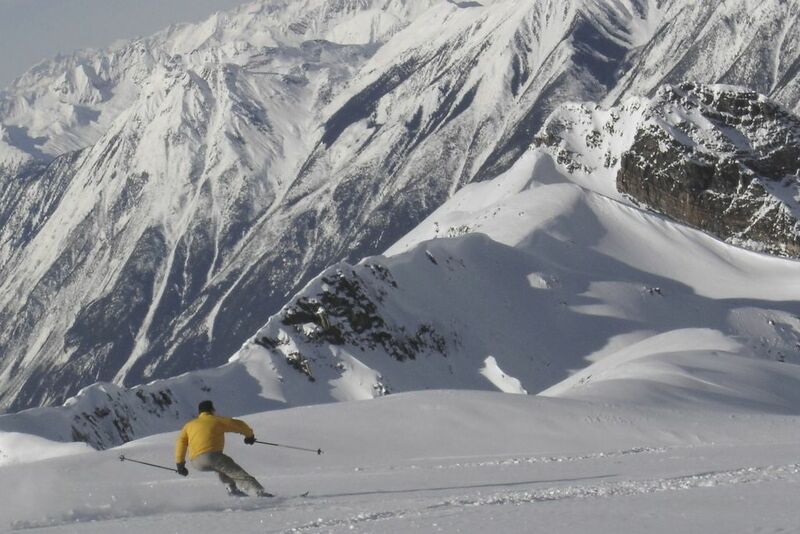 These seracs are not skied by Chatter Creek cat skiers, but Dan Hudson and his friend Eric use them for some great glacier skiing photos. The Sullivan Fault rises in the background. Ready to rock and roll. 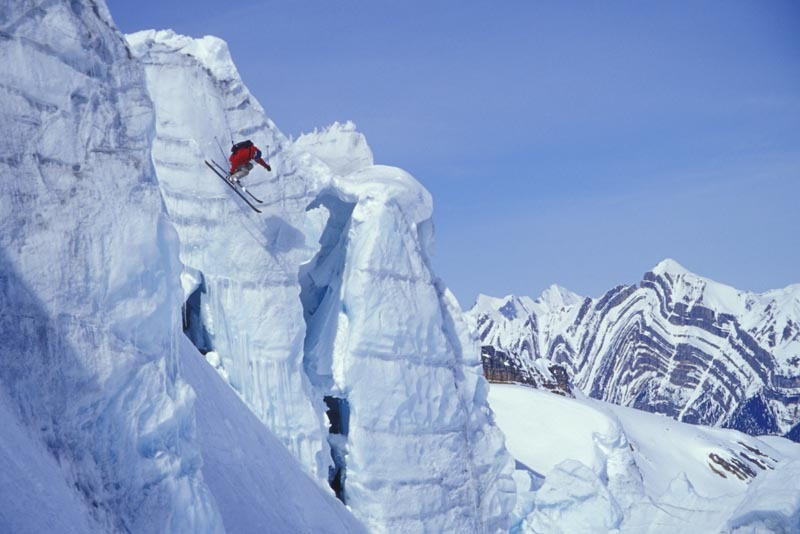 Let's do a little glacier skiing! Click on any Chatter News photo to enlarge it. 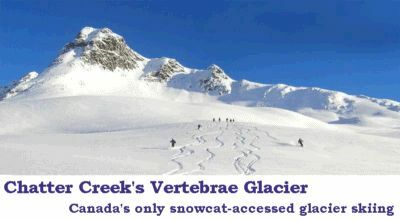 Use the browser's "Back" button to return to "Glacier Skiing at Chatter Creek"
Glacier skiing on the Vertebrae glacier at Chatter Creek. Todd Nash surveys the easterly view. Mt. Columbia and the Snow Dome are out of the picture to the right, in the southeast. Tsar Peak stands on the horizon. The Sullivan Fault is in the middle of the photo. This is the backdrop for glacier skiing at Chatter Creek. Easy turns glacier skiing on Vertebrae glacier at Chatter Creek. Photo credit to Wendy Robinson. 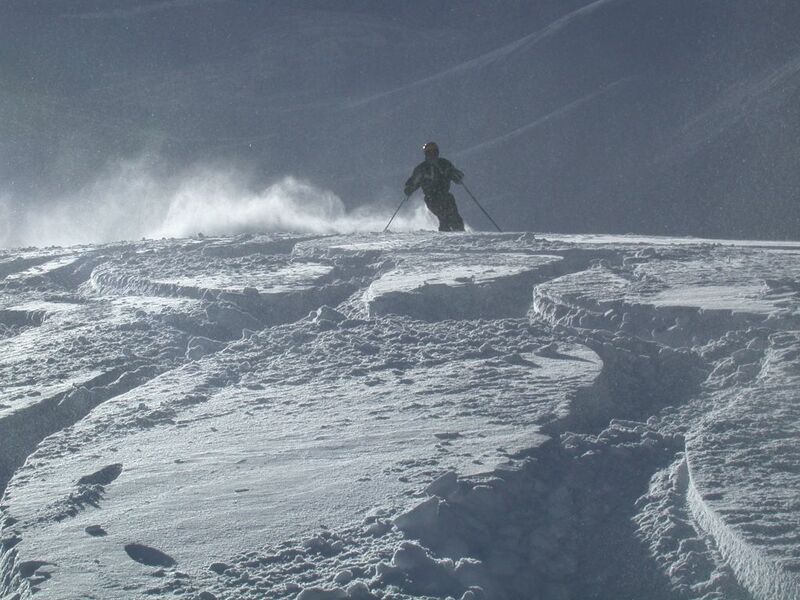 There's lots of mellow powder skiing on the Vertebrae glacier. There are some steeper runs, too, especially some of the lines that drop into the glacier. 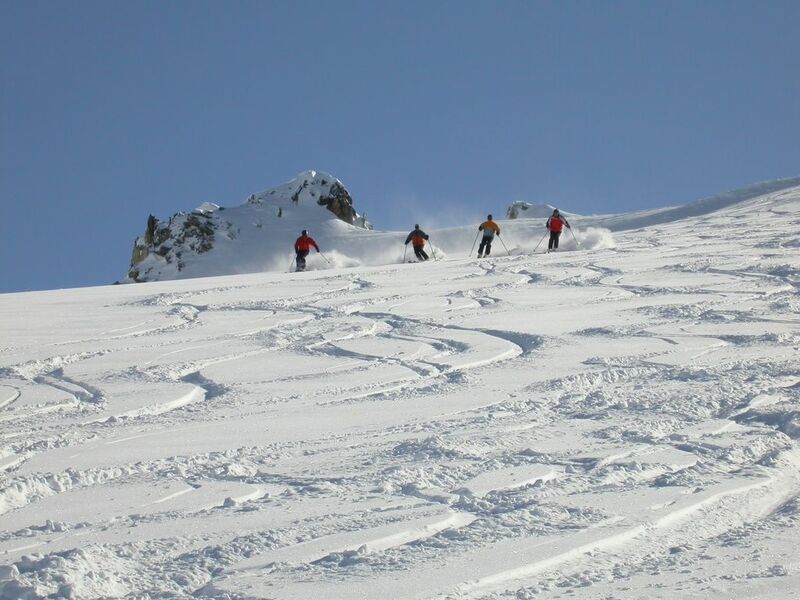 The glacier skiing at Chatter Creek is a favorite among many guests. Click on any Chatter News image to enlarge it. Use the Browser's "Back" button to return. A busy day glacier skiing on Chatter Creek's Vertebrae Glacier Thanks to Cliff Jenning. 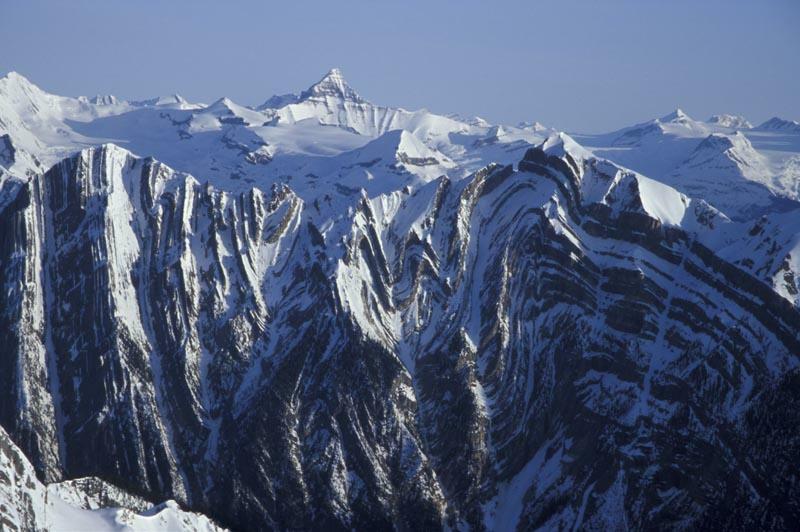 Tsar Peak (3424 m) rises above the Sullivan Fault in this high-contrast shot by Dan Hudson taken from Chatter Creek's Vertebrae glacier. The view is roughly north and looks over an area of icefields and peaks of the Canadian Rocky Mountains. Tsar Peak lies west of Mounts Columbia and Bryce, and east of Mount Clemenceau and the Clemenceau icefield, also visible from the Vertebrae glacier. Looking down the Vertebrae Glacier, photographer Wendy Robinson captures the Sullivan Fault, the well known geological feature that bears witness to the tremendous folding that occurred during the formation of the Rocky Mountains. 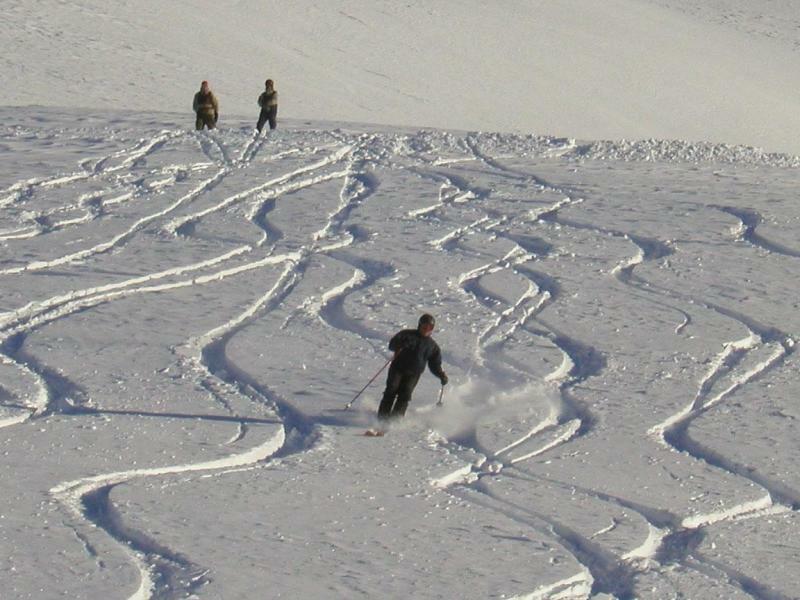 The glacier skiing at Chatter Creek is very popular. For more photos and information about snowcat skiing at Chatter Creek, click here to visit the Chatter News.